In 1988, violist Hsin-Yun Huang was the youngest-ever Gold Medalist of the Lionel Tertis International Viola Competition, and came to further international prominence in 1993 when she was winner of the top prize of the ARD International Music Competition in Munich. 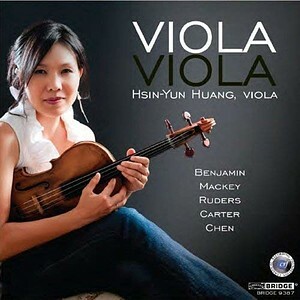 Ms. Huang's fascinating program, entitled Viola, Viola includes premiere recordings of new works composed for viola by Steven Mackey (a chamber concerto), a suite for viola and piano by Danish master Poul Ruders, and a single-movement "remembrance" for viola and orchestra by Taiwanese composer Shih-Hui Chen. In addition, Ms. Huang gives spectacular readings of British composer George Benjamin's viola duo, Viola, Viola (alongside her husband, violist Misha Amory) and Elliott Carter's Figment IV, composed during the composer's 100th year.